From a sector weight perspective, the high beta stocks tend to have larger allocations to the more economically sensitive sectors, for example, Industrials, Technology, Energy and Financials. Conversely, the high beta index is under weight the traditionally more defensive sectors like consumer staples and utilities. 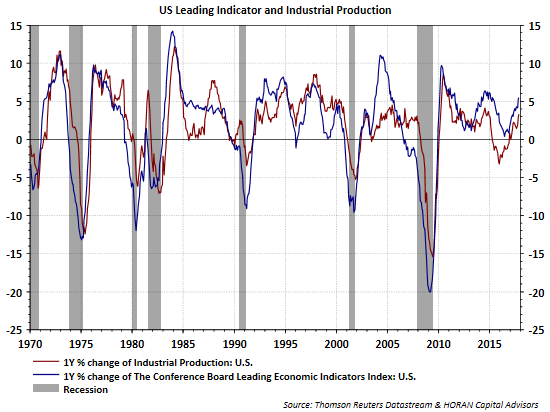 The blue line in the first chart at the beginning of the post represents the Conference Board's Leading Economic Indicators Index. 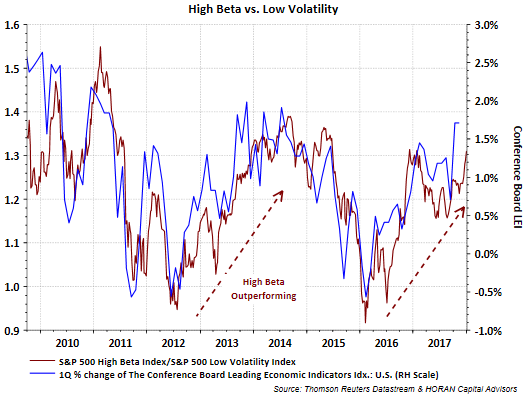 Of significance is the fact high beta stocks as a group tend to outperform low volatility ones when the economic data is improving. By its nature, a positive LEI Index is representative of an improving economy and not a recessionary one as can be seen in the below chart by comparing the blue LEI line to the recessionary grey bars. With the recent passage of the tax reform package in Congress, a stimulative economic impact is anticipated. It is quite possible the economic cycle gets extended as a result of the benefits that accrue to the economy from the tax reform legislation. The fact economically sensitive sectors are once again outperforming indicates the market may be expecting this as well. This week's fourth quarter earnings reports by S&P 500 companies will be weighted towards financial stocks and company comments around their outlook should be a key focus for investors.